FYI, for benefit of all contest lovers. see Starhub's bill at bottom. I advise him to approach CASE of Singapore who can settle disputes between service providers and 3rd parties invloved. Quite recently I received a SMS which prompted me to participate in an easy to win gift voucher from any of the 3 supermarkets which included NTUC Fairprice, Giant and ShenXiong. It gave a simple question from the start such as to name 3 types of taxis in singapore. After passing the question, one question after another came thru SMS and I felt bored and meaningless and ended the participation without expecting anything less of the gift vocher. 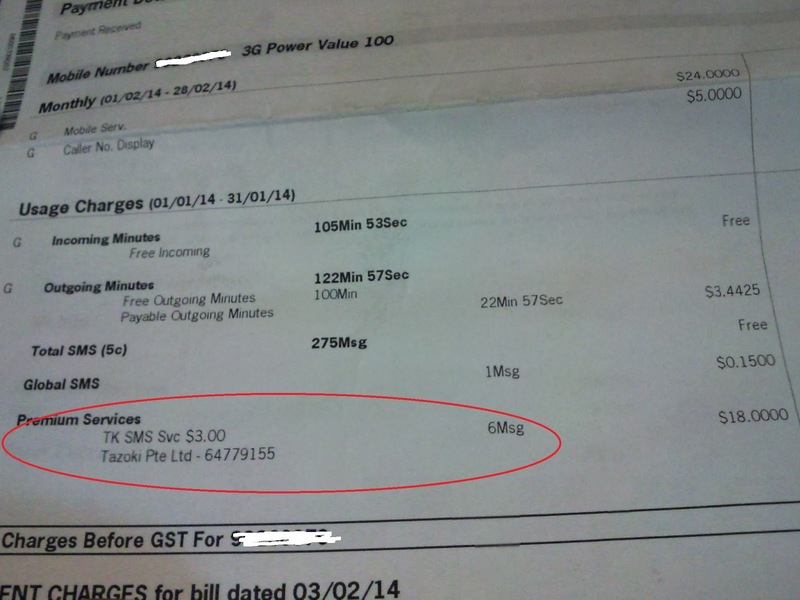 To my horror, the phone bill from my provider, StarHub, charged me $18 under premium services. This is as good as daylight robbery. If I decide to lodge a complaint do you know which body should I address it to? By the way the company which conducted the survey questionaires is called Tazoki Pte Ltd tel 6477 9155 "